Introduction: To say that the written word carried a lot of weight in the Middle Ages would be an overstatement. After all, before the printing press arrived, every word was handwritten. However, in medieval times some written words carried more weight than others. Readers of Saint Augustine or Aristotle could be overheard saying ‘I have it on good authority that…’, simply because these authors were just that. Curiously to our modern eyes, the pages of authoritative medieval texts, whether filled with the truisms of a Church Father or a philosopher’s wisdom, do not necessarily convey authority in a material sense. 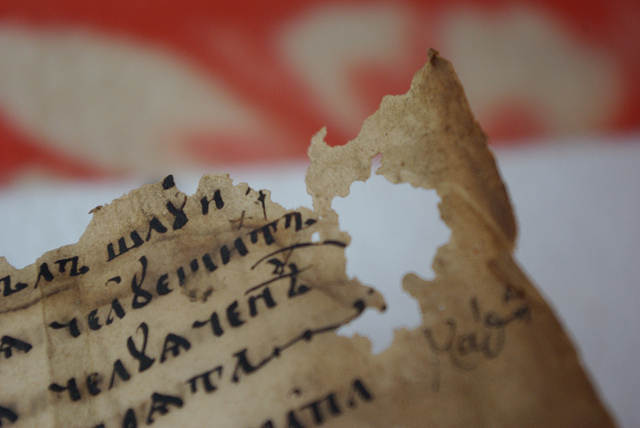 Medieval book producers were pragmatic and they did not share our modern sentiment that an important text should look important too: They had no issues writing the Bible on heavily damaged sheets or keeping important texts in mouldy corners of the library. It is the juxtaposition of status – and consequently authority – and poor appearance that is highlighted in this photo essay. The images on the following pages show just how telling damage can be: It sheds light on the attitude of scribes, who simply ignored holes in the page; and of readers, who perceived Saint Augustine and Aristotle as authoritative even if their words were written on scarred and ripped materials. This essay ultimately shows that while the velvety softness of perfect skin is appealing, getting to know imperfect parchment is in the end more interesting and rewarding for the historian of the medieval book.